Spinner Arul Suppiah turned in the best Twenty20 bowling figures recorded in world cricket to catapult Somerset back into FL t20 contention in Cardiff. The slow left-armer took six wickets for five runs in 22 balls as Glamorgan tumbled from 72-4 to 98 all out. His haul beats the previous T20 record of 6-14 by Sohail Tanvir for Rajasthan against Chennai at Jaipur in May 2008. Somerset stumbled themselves on 44-4 before Kieron Pollard hit 31 off 20 balls to win by five wickets on 99-5. The visitors' win, with five and a half overs in hand, cements their place in second in South Group, on 16 points. Having lost their previous two matches, Somerset are back on course for a place in the last eight, leading the pack behind South Group leaders Hampshire. But, while most of their rivals still have four games left, Somerset have just two group matches remaining - both against the bottom two. After Sunday's home date with local rivals Gloucestershire (8 July, 1730 BST), they then play bottom side Middlesex at Southgate on Sunday (10 July, 1430 BST). The home side, who were put into bat by Somerset on a turning pitch, which had been used for two previous FL t20 matches, had no answer to Suppiah and the other two visiting spinners, Murali Kartik and Max Waller, who took all 10 wickets between them. In the end, Glamorgan were dismissed for their second worst total in the tournament's history - in just 17.4 overs of an 18-overs-per-side contest which was reduced because of rain. After former India international Kartik had proved virtually unplayable on a spin-friendly surface, it did not get any better when Suppiah entered the attack as he rattled though Glamorgan, who lost their last six wickets inside half an hour. The visitors also struggled on the tricky wicket but Pollard struck Simon Jones for three fours in an over to take the pressure off. 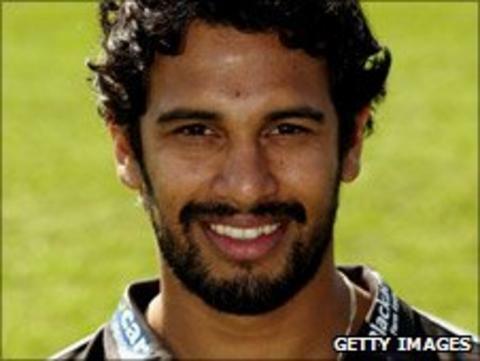 Suppiah, who was born in Kuala Lumpur but moved to Somerset at the age of 13 and is now in his 10th season in county cricket, had never taken more than four wickets in an innings for Somerset. He took 3-46 against West Indies A on his county debut in July 2002 - and those remain his best first-class bowling figures. And the only four-wicket haul of his first-team career came when he took 4-39 against Surrey in a C&G Trophy game in May 2006. "On a night when Arul Suppiah created a new world record, Glamorgan are for all purposes out of contention for a place in the last eight. "Suppiah took his six wickets for five on a pitch which turned a lot, far too much for a Twenty20 game. "Glamorgan's bowlers did their best, Robert Croft taking 3-9, although he didn't bowl his last over, while Jim Allenby didn't bowl at all."